jayinhk wrote: I know the kraft paper pouches are popular, but I got green tea in one in China and the smell of the adhesive was horrendous! It scared me away from them. I now stick to plain PVC pouches and double vacuum seal them, and I have a label printer, so no need to write on the bags. You are set up well. I never stuff pouches so much that the ziplocks are strained; so, I don't need to seal above the ziplocks. Pouches have stayed closed without problems. I bought Stockdepot's best (extra thick at 5.6 mil) but got samples of others. All pouches did not smell bad and all had good ziplocks. I've bought tea from a few vendors that came in Kraft paper/foil pouches and never smelled anything bad. I doubt that the adhesive issue is common, but if I buy more pouches I will buy from Stockdepot again (made in USA) since the net price (shipping plus product) is about the same as what comes from China. Yup, sticking with what's tried and tested sounds like the way to go. PVC isn't ideal either, but it is lightweight and cheap and I like sending tea vacuum sealed to prevent aroma/moisture transfer. I've tried both Baozhong and Wuyicha that had turned into something like pu erh from exposure to the atmosphere! I keep most of my oolong in an air conditioned room, away from the humid rooms I store my pu erh in. It's essential to keep oolongs airtight in this part of the world because it deteriorates so fast unless stored carefully! I've been throwing in those sealing rods with each bag of oolong/green tea so buyers can keep their tea airtight once they open up the bags. I prefer aluminium foil ziplock for storing teas. It is very easy to squeeze out the excess air in them so they are better at keeping air, light, moisture, etc. out compared to paper or plastic pouches. Drinking some decent and excellently-priced Puttabong Organic from Jayshree direct, one of 15 Darjeeling sku's they have listed currently. Looks green, tastes a bit green-white, with hints of subtle oxidization. Interestingly, taste seemed improved on this session when left to cool down to room temp. To continue the storage thread, Jay Shree ships in vacuum sealed non-resealable, heavy-duty foil bags that I'm sure keep the tea very fresh when sealed. This 100g I just put in a mason jar in a dark cabinet. The 2x 500g foils I have from them, I kept in the foils, taped, inside plain oversize clear zip-locks, inside sterilite moisture+air "resistant" tubs, in the basement. I should probably figure out a better way to store them though. Drinking Championship Black 2016 from Dr Chen's, hot; though it is 88F in this steaming apartment whose air conditioning broke yesterday. It is cooler outside than in the apartment. I've been drinking Thai whole leaf black tea with spices from Tea-Village in Thailand with lots of ice and sweetened condensed milk. It is tasty and a real cooler. I drank so much the calories are adding up. So plain hot black tea should keep me from gaining too much weight. And this tea is so delicious and complex. I now put a first and second infusion in a server and let it cool a bit; but it is still hot. I've been drinking this tea for almost two years now, and it matures just beautifully in individual 100g multi-layer bags. As long as you don't really oversteep it there's almost no astringency here, not necessarily a good thing in my book. Taste wise I get a nice masala of pretty intense fruity notes (oranges), a bit of cocoa, somewhat close to some Yunnanese yellow teas I've sampled a while ago but this Chiyabari has some extra warm spicyness, almost like Nuremberg almond gingerbread. On the downside there are no real dynamics to speak of; this must be one of the most reliable / least finicky teas I care to remember but I usually favor more challenging leaves - YMMV. Very well written description of that tea. I wish I was as good as you are at identifying and describing particular flavors. When I prepare a Himalayan black tea, I want particular flavors; so, it is most interesting to me that you find the "reliability" of getting those flavors slightly boring. I had that exact tea and other black teas from Jun Chiyabari in 20-gram foil bags which I opened after 2 years a few months back. Initially the tea was flat. The leaves needed a week or so in ceramic tea caddies to come back to life to produce flavors you describe so well. When I was first enjoying the black teas from Jun Chiyabari, I cared about the differences of their offerings. Now that I am drinking that type of tea only several times a month, I find it easy to be happy with the one that I bought in large quantity (Himalayan Orange). I've had my share of really nice stuff over the years but at the end of the day what I'm really interested in is drinking teas that match a specific moment or situation as closely as possible. Interestingly it doesn't need to be anything exotic - more often than not it's just some rather humble stuff. Right now I'm drinking some El Cheapo 2013 Xiaguan 8653 sheng pu, it does the trick just beautifully and I wouldn't want to change it for any other tea. Exploring a few teas Ferg gifted me over the past year. This afternoon, Essence of Tea's 2016 Beyond the Clouds Hongcha, named after the old growth trees located at 2,200m in the Ai Lao mountain range. A very pleasant medium oxidized hongcha that is crisp and sweet with lots of complexity extending into several steeps. Halmari Gold 2017 Second Flush Assam. Spectacular, best Assam I've had since 2012. I'd tried some mid-level 2016 Halmari and been unimpressed, but this top-shelf invoice is fantastic. Just as perfect as top Mangalam 10 years ago, perhaps even superior. I'll make a better effort to describe it when more arrives, but I had my impression corroborated by another long-time Assam drinker. Apparently, 2016 Halmari Gold won best Assam at the 2017 World Tea Expo. I'm not sure how many were judged, but it's nice to find some potential palate-validation. Now just counting the days until more arrives, with childlike anticipation. joelbct wrote: Halmari Gold 2017 Second Flush Assam. Spectacular, best Assam I've had since 2012. Did you receive the above mentioned tea yet? Today I took delivery of packs of the Halmari gold GTGFOP1 Clonal and the Halmari Gold Golden Tips teas. Usually I would have been immediately heating the tea water and sampling each straight away but I've been delayed by unusual circumstances pertaining to the shipping carrier badly mishandling it all. But have you had a tasting experience with yours. As for myself I at first delayed ordering after I received the announcement from Halmari Estate of the new 2017 crop picking was shipping. I noted that on the Halmari Gold GTGFOP1 Clonal internet page was still listing "plucked June 2nd flush" again without the year specified. I made an inquiry of them asking if they were shipping only 2017 teas or was this some remaining teas from 2016. 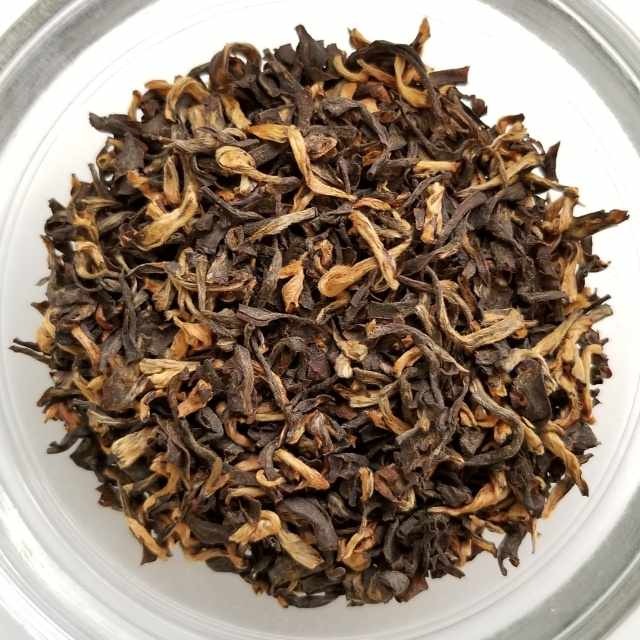 I got a very quick reply from Amarawati Tea Co. Ltd/Halmari estate that said "as soon as the new season second flush comes in , we immediately update our stock with the new one. All teas are June 2017 production currently and have been for the last 3 weeks and they are as fresh as they get." I immediately ordered their tea but will have to wait a few days longer for a replacement shipment. Was looking for your report on how the 2017 Halmari is in the cup after a steeping a few pots full? Had you had this same grade Halmari tea from this 2016. I thought last years tea that I received in mid December from Amarawati Tea Co was good but by late March it was fading quickly as were many other 2016 Assam teas I had on my tea shelf. I have so far received a 10g sample of Vahdam's Halmari Gold (ordered more at $62 for 300g shipped) and a bigger bag of Halmaritea.com's "GTGFOP1" ($43 for 250g shipped). They are both excellent, both have that distinctive honey note, and astringent/puckery aftertaste/mouthful, and really special flavor and tannin profiles. I'll do a side-by-side next week. As you can see, Halmari's is a bit more whole, so a higher Pekoe grade, though I've never seen "GTGFOP1" before. The Vahdam batch had more of those fuzzy red hairs that I remember from top grade Meleng and Mangalam '08-'12. And the Vahdam's taste hit me over the head. At first I'd thought the halmaritea.com batch wasn't as good, but it just needed to be steeped 3:15 min instead of my usual 3:45 or 4. I'll probably drink 2 kilos over the next 12 months. Having a cold-brew Hongyu red tea. This tea is also known as Nr.18, Ruby Red, Sun Moon Lake, etc., one of the famous red teas from Taiwan. Prefer the high mountain black oolongs, more nuanced and less in your face. Also more forgiving to brew. They are both excellent, both have that distinctive honey note, and astringent/puckery aftertaste/mouthful, and really special flavor and tannin profiles. Today received shipment of a second 500 gram bag of the Halmari gold GTGFOP1 Clonal. On my fourth pot full this morning and can only agree with your tasting notes stating a "distinctive honey note, and astringent/puckery aftertaste/mouthful, and really special flavor and tannin profiles" for this tea. I'm especially liking the malty notes that come through. Very smooth quality in the cup. I've been holding steeping times to 4 minutes. Had to back off my usual measure of leaf for this tea as I was experiencing a lot of strength in the cup. Last years Halmari Gold GTGFOP1 Clonal from this same vendor was good enough standalone but I favored it more as a half/half blend with a good Mangalam golden tippy. When I ran out of the Mangalam the Halmari was fading early. Haven't seen any good Mangalam yet this seasom. TeaBox though has just recently relisted a Mangalam Gold for 2017. I went through 800 grams of the TeaBox 2016 Mangalam tea last year and although I thought it a middling grade tea it was very good in a blend with higher grade teas like the Halmari top grades. Thanks for the report on the Vahdam Halmari Gold. They had the best Halmari Gold in 2014 that was sold out twice and I long regretted not bringing in more. What I had of it never faded much over twelve months that it was on my shelf. Their 2016 Vahdam Halmari was not so good. Based on your report I am looking forward to sampling this new season Vahdam Halmari. Could you reveal what water you are steeping your tea with? I'm currently using three bottled spring waters. I'm been long time obtaining best results with Ice Mountain sourced Evert Spring, MI. My second choice of water is Poland Spring water sourced out of state of Maine. I'm always trying other water sources yet too.